Words are very important in Christian Science, one of the most commonly used words is perfect, for example, man is made in God’s perfect image and likeness. 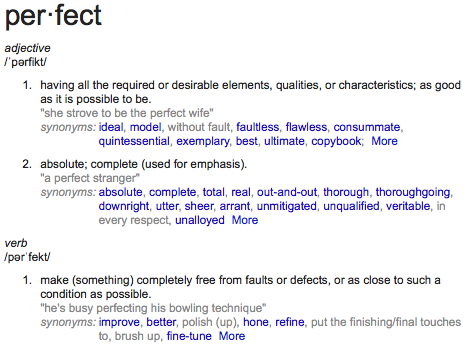 In Christian Science, perfect is used as an adjective — man is ideal, flawless ,without fault, exemplary. Man’s state of perfection is presented as FACT, to accept anything less is to allow aggressive mental suggestion (which is unreal) to undermine man’s perfection and leave him vulnerable to the Christian Science Trio of Doom — Sin, Disease and Death. I struggle with perfection. Society tells us we must have the perfect house, the perfect car, the perfectly well behaved children, the perfect holiday, the perfect birthday party, the perfect material stuff. Christian Science tells us we must have our thoughts constantly, perfectly aligned with God, otherwise, all our material perfection — the perfect house, our perfect health, our perfect job (or perfect source of income) none of which is real anyway — will come crashing down. The condition of our unreal material existence is dependent on our Spiritual Perfection. In Christian Science perfect is always used as an adjective, it is the state of man, perfect is never a verb, it is not something to be aspired to, we are perfect. We do not need to be improved, or refined, we ARE PERFECT. Except when we fall short, when we fail to realize our birthright as Children of God. When we imbibe alcohol, indulge in tobacco, or consume caffeine. We are perfect except when we are distracted by the lusts of the flesh, or seduced by the false unreality of matter. We are perfect until we drop our guard and fall prey to Malicious Animal Magnetism, or Aggressive Mental Suggestion — those are error, which is false and unreal, but something to be very much on guard for. Perfect as an adjective is unrealistic, nothing is truly flawless. The Bible, the supposed foundation of Christian Science, and the key figures of Ms. Eddy’s inspiration, Jesus, Paul and Luther all had flaws. Ms. Eddy herself failed to consistently live up to her lofty aspirations: her material body did not ascend, it was buried. Perfect as a verb is a bit more manageable, it is possible to refine something to improve it, but you also have to know when to step back and acknowledge that sometimes it is good enough. Finding that balance of refinement and acceptance that it is good enough is tricky, and something I struggle with daily. TMC Withdrawals – now via e-mail! One would be in less danger/From the wiles of a stranger/If our kin and kith/Were more fun to be with. – Ogden Nash — who somewhere wrote a funny verse about CS which I cannot trace. Consonant with the tenor of this post, even the most radically reliant Christian Scientist discovers that even a perfect stranger becomes imperfect when the Truth is known!